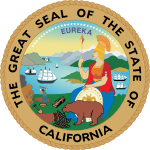 California is a state in the western United States. It is the third largest state in size. It is the state with the most people living in it. 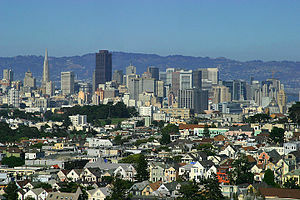 Largest cities are Los Angeles, San Diego, San Jose, and San Francisco. The capital is Sacramento. It became a state on September 9, 1850. It is bordered by Arizona to the southeast, Oregon to the north, Nevada to the east and the Mexican state of Baja California to the south. The geography of California varies depending on region. Southwestern California has small mountain ranges and the cities of San Diego and Los Angeles. Southeastern California has the Mojave Desert and Death Valley, the lowest place in the United States. The eastern part of the state has the highest point in the United States outside of Alaska, Mount Whitney, in the Sierra Nevada mountain range. The cities of Sacramento, Bakersfield, and Fresno are in the Central Valley. The valley has the Sierra Nevada to the east and the Coast Ranges to the west. It is California's single most productive agricultural region and one of the most productive in the world. It produces more than half the fruit, vegetables and nuts grown in the United States. More than seven million acres (28,000 km2) of the valley are irrigated by an extensive system of reservoirs and canals. The west-central part of the state has some small mountains and the cities of San Francisco, San Jose, and Oakland. 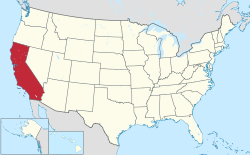 Northern California has the Cascade Range, the Klamath Mountains, and the Modoc Plateau. Far northern California does not have many people, but the San Francisco region and the Sacramento region are often thought of as part of northern California. The state is a leader in three businesses: farming, movie-making, and high technology, mostly software and websites. Aerospace used to be a large industry there, but it has been downsized in the last 20 years. There are many earthquakes in California. They happen when two earth crusts shift underground. Californians need to be prepared for earthquakes and often store extra food, water, flashlights, and first aid supplies in case of such an emergency. California has more people than any other state in the United States. 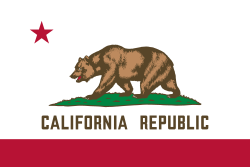 If California was a separate country, it would have the sixth largest economy in the world. California is probably the state with the most ethnic groups. It also has many different geographic features — mountains, deserts, and coasts. It is often called The Golden State. The state flower is the golden poppy. The post office uses "CA" as a shorthand for California, and the Associated Press uses "Calif." or "Cali." In 2019, Gavin Newsom became the governor of California. Before him, the governor was Jerry Brown. On November 4, 1992, Dianne Feinstein became one of California's United States senators. On January 3, 2017, Kamala Harris became the other one. California was more conservative during the 1960s and 1980s when its former governor, Ronald Reagan, ran for president as a Republican. Today, California is more liberal and less conservative. In 1900, there were only a million people in California and 105,000 in Los Angeles. Today, California has more people than any other U.S. state. Starting in 1965, the variety of people became much greater as many different people from around the world came to the United States and often decided to live in California. California is thought to be a very liberal state, but there are still a lot of people who are Republicans and view Ronald Reagan as a hero. Technology is very advanced and many new cultural trends begin there. Engineering and computers play a big part in the state's life. For over a hundred years, film has been one of the most important businesses in California. 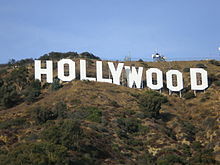 By the 1950s, television had also become an important business in California. ↑ 1.0 1.1 "Government Code Section 420-429.8". State of California Legislative Council. Archived from the original on March 25, 2014. Retrieved December 24, 2009. ↑ "California: Population estimates". U.S. Census Bureau. January 4, 2019. Retrieved January 4, 2019. ↑ "Median Annual Household Income". The Henry J. Kaiser Family Foundation. Retrieved May 19, 2018. ↑ "Elevations and Distances in the United States". United States Geological Survey. 2001. Archived from the original on October 15, 2011. Retrieved October 21, 2011. ↑ "USGS National Elevation Dataset (NED) 1 meter Downloadable Data Collection from The National Map 3D Elevation Program (3DEP) – National Geospatial Data Asset (NGDA) National Elevation Data Set (NED)". United States Geological Survey. September 21, 2015. Retrieved September 22, 2015. ↑ "Government Code Section 424". State of California Legislative Council. Retrieved July 25, 2014. ↑ "The Geography of California". NetState. 5 January 2014. Retrieved 13 July 2014. ↑ "Federal Agencies Release Data Showing California Central Valley Idle Farmland Doubling During Drought « Landsat Science". ↑ "California Geography". Maps of World. 5 June 2014. Retrieved 13 July 2014.